Software Development & Support since 1988. An easy to use, professional auction management system. An easy to use, professional auction management system. From receiving goods to invoicing buyers and paying suppliers. The program has been in daily use in Auction Houses throughout NZ since 1994. 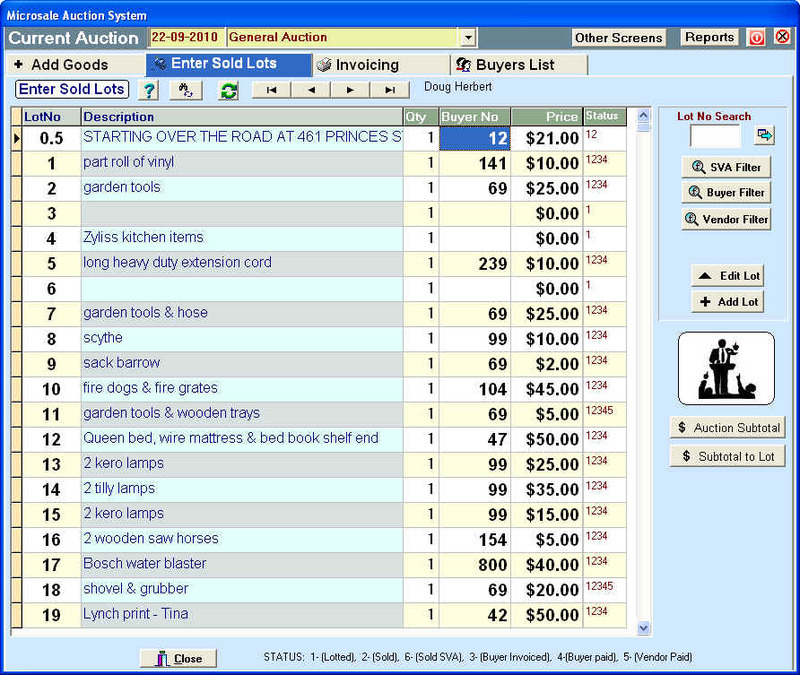 New Multi-User version available to streamline Goods received and lot auctions. Catalogues may be customised and saved in a number of different formats. Extended descriptions and graphical images may be stored for each lot entered. Regularly used descriptions may be saved for re-use. One button Copy Lot function. Vendors may be added when entering Lots. A default buyers premium may be set, but can be adjusted for each buyer. Vendors may be set individual commission %, Minimum commission charge, Advertising, Cartage rates, Storage fee, minimum extra charge etc. Buyers can have charges such as Credit Card, Shipping etc added to an Invoice autmatically. All goods auctioned may be tracked as far back as required. Full account records for Regular Buyers. Invoices and Vendor payments can be easily re-printed, as well as emailled directly from the program. Customisation of Invoice and Catalogue Headers. Fast and efficient method of entering sold lots and printing buyers invoices. All Sold lots may be easily altered. Designed to streamline the entry of sold lots. Multiple lots may be grouped, and Single Lots may be split, during an auction. View more than 20 Lots on the Enter Sold Lots screen for easy checking. New Lots may be added “on the fly” from the Sold Lots screen. Buyers invoices may be printed with only a couple of keystrokes from the Sold Lots screen. Two Auctioneers selling different lots handled easily from the Sold lots screen. Various Catalogues to choose from with changeable graphic size, Auction Sheets, Full Auction, Buyer and Vendor Reports or Summary, Buyers Still Owing, Lots vs Prices etc. 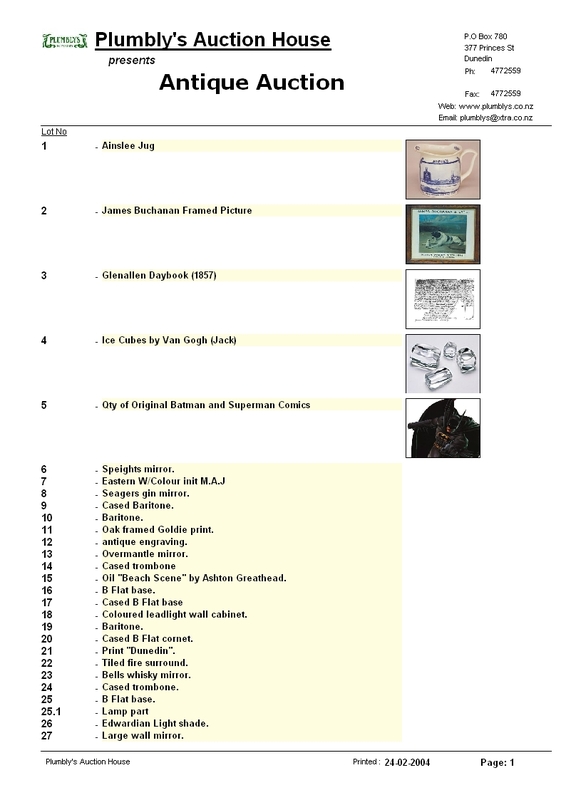 Buyers may ask to view (and print if required) all lots they have bought to date. Choice of Mouse-Clicks or Keyboard Function Keys for various features throughout the program. Full help and training supplied. Please enquire for Multi-user version pricing. Download the demo and test-drive it today! I have found CounselPro is a very effective program that securely holds confidential counselling notes and student information…CounselPro has become an invaluable tool, especially in regards to accessing data and statistics that helps me recognise and summarise presenting issues, year level, gender and socio-cultural trends while also assisting our school to implement year level or whole school strategies. The system is very user friendly (even for a techno-phobe such as myself!) My Principal and Board have found the charts and reports important in terms of understanding and developing ideas about student health and well-being and I have no concerns about maintaining individuals confidentiality. Donald has been an absolute star and a great support for me. He has been readily available to assist me whenever I’ve got stuck – mostly with same day service! The team-viewer aspect of the program has been very helpful and on several occasions Donald has also spoken with our ICT whiz to help support the school and make sure that we are making the most of this wonderful resource…I would absolutely recommend Donald and CounselPro to any counsellors! © 2012 MicrosaleNZ Ltd. All Right Reserved.